By now, we’re all used to floral centrepieces, paper lanterns and strings of fairy lights decorating a wedding. But what we seldom see in Indian wedding décor is fruit. Just as colourful, creative and actually less expensive than even floral arrangements, fruits are a fabulous choice to deck your wedding halls with. Plus this edible wedding décor idea could totally double up as snacks for your guests to much on! Everybody lovesss fruit. There a number of things you can do for some creative and nice-looking fruit centrepieces. Filling up a bowl or a container aesthetically with choice fruits is the most convenient one. You could also combine fruits and flowers together for a lovely pop of various colours! If you want to stick with inedible, carve out a pineapple and use it as a vase to hold flowers. A little more work, but definitely worth it! These are rather simple to incorporate. 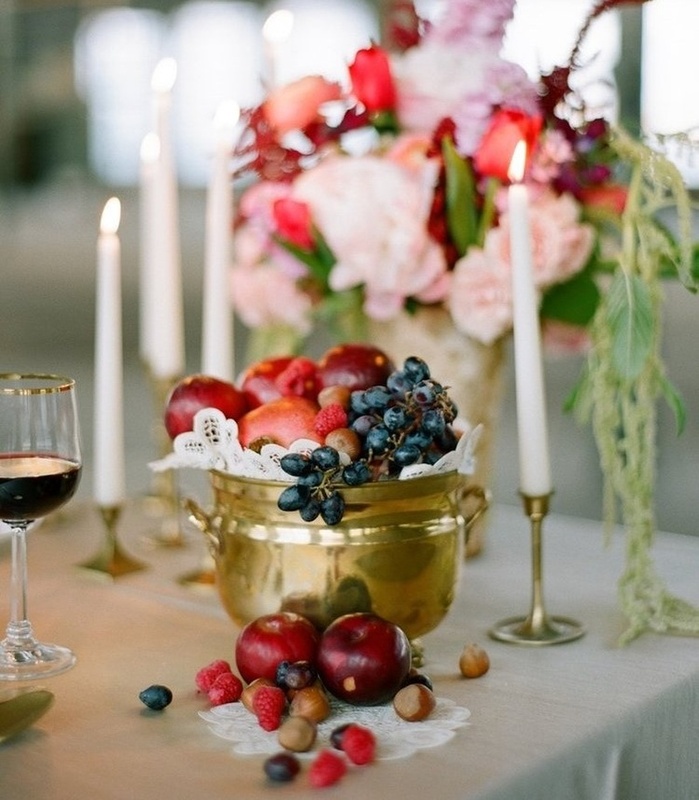 All you need to do is lay out your favourite fruit at your wedding dinner table in a pleasing manner! It could serve as a healthy entrée to your wedding meal. Light up your venue with some apple based candles. All you need to do is hollow out apples and place small candles inside them. If you don’t want to do the work, fill up some pretty birdcages or any nice container with fruit. You could also hire a decorator and go all out by having some amazing fruit installations. Look out for the fruit swan in the pictures! Bored of plain old white icing? Naked cakes with fruit toppings, chocolate sticks holding in a mixture of fruits or simply a fruit flavoured cake are some of the other options you could try out. Check out these creative fruit based cakes and tell all your cake ideas to your vendor for that perfect dessert affair. Skip the pan, mukhwas and mithais for some healthy food! Fruits are a great way to spoil your guests and send them off with some edible wedding favours that they will love more than that predictable box of ladoos.